So we lie here, every minute feeling like an hour, counting down until the next possible opportunity to get back on the oars and out of this terrible place. If there is a living hell this is it. 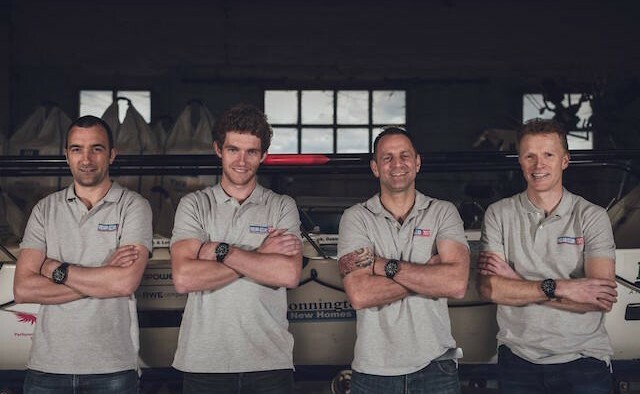 On 6 July 2018, Robin Buttery – who was diagnosed with Parkinson’s at 43 – and his crewmates Billy Taylor, Barry Hayes and James Plumley set off from Western Australia in an attempt to row 3,600 miles across the Indian Ocean. The Parkinson’s Life team has been following the crew’s progress via their regular blogs and livestreams – here are the highlights of the story so far. The crew sets off from Geraldton, Australia, at 8:06am local time. They are escorted by the Geraldton Volunteer Marine Rescue boat to ensure they make it safely to deep waters. 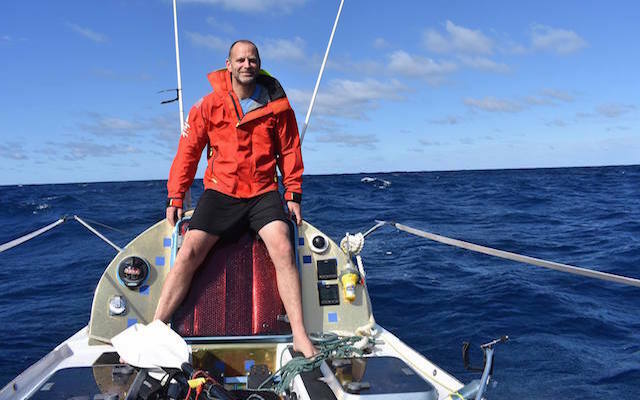 Despite the choppy waves and sea sickness, the crew makes good time and is through the Abrolhos Islands inside 24 hours, which they weren’t expecting. 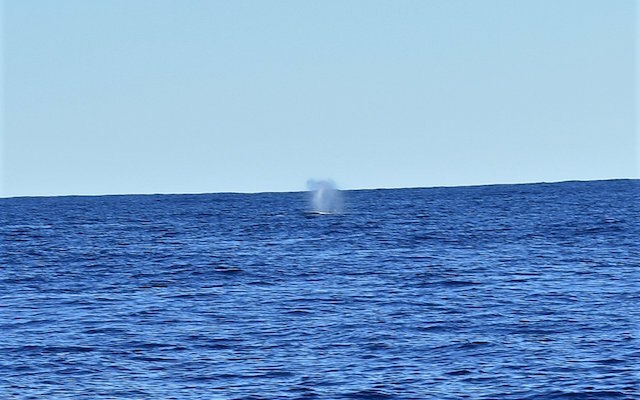 The team enjoys a glimpse of a whale. The crew has started to get into its new routine, and has adopted a ‘two hours on, two hours off’ system. The crew begins to worry about its toilet facilities, with Billy fearing “a misplaced poo thrown into a badly judged wave” – Robin keeps morale high with some karaoke. The team is also buoyed by the unexpected news of England’s World Cup performances, and disappointed at the prospect of missing them making the final. The crew is making good progress thanks to a strong current pushing them in the right direction, and are enjoying the daily sunrises at sea. The team gets into their new routine. 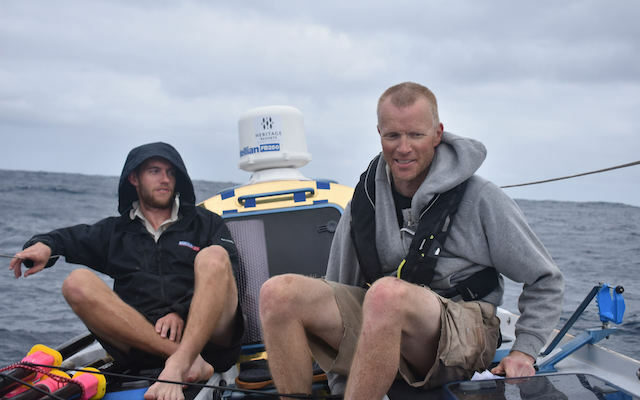 Progress is slow and morale low, as strong winds push the team back towards its starting point in Geraldton, Australia. The rowers make the decision to drop the sea anchor, which will help them maintain their position — but inevitably hampers their progress. James Plumley (left) and Robin Buttery (right) on deck. The team has to use the sea anchor for the fifth time due to continued bad weather — and is forced to take shelter in the cabins on board. Due to Robin’s symptoms, he resides in the forecabin by himself. Barry says: “The rest of us are sharing the rear cabin, which is just about the worst place on earth right now; not wide enough for all three men to lie down next to each other. 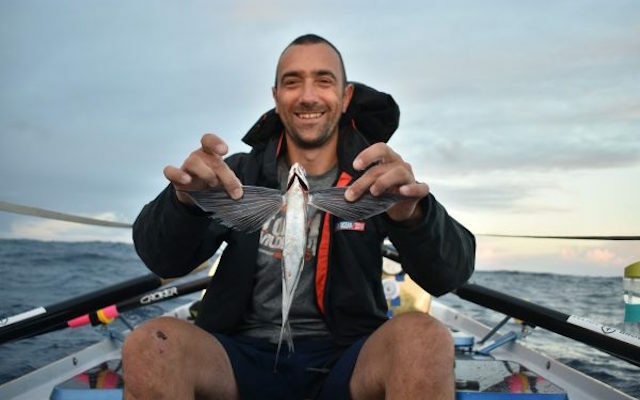 Some comedic relief is provided — as James gets hit in the face with a rogue flying fish while on deck. Barry Hayes holding a rogue fish. Billy Taylor on a morning shift. 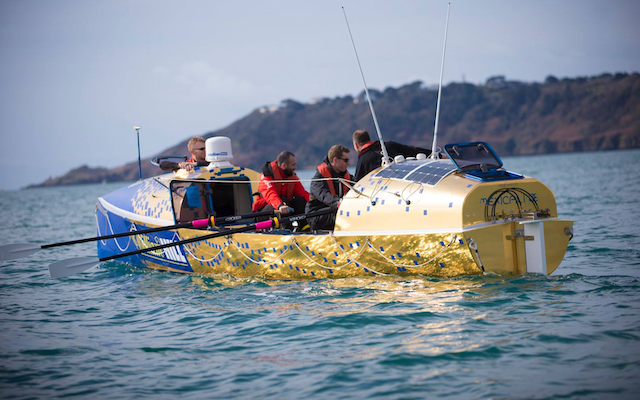 To keep up to date with all the team’s goings on – or to donate to the Indian Ocean Row 2018 – visit the official website here.